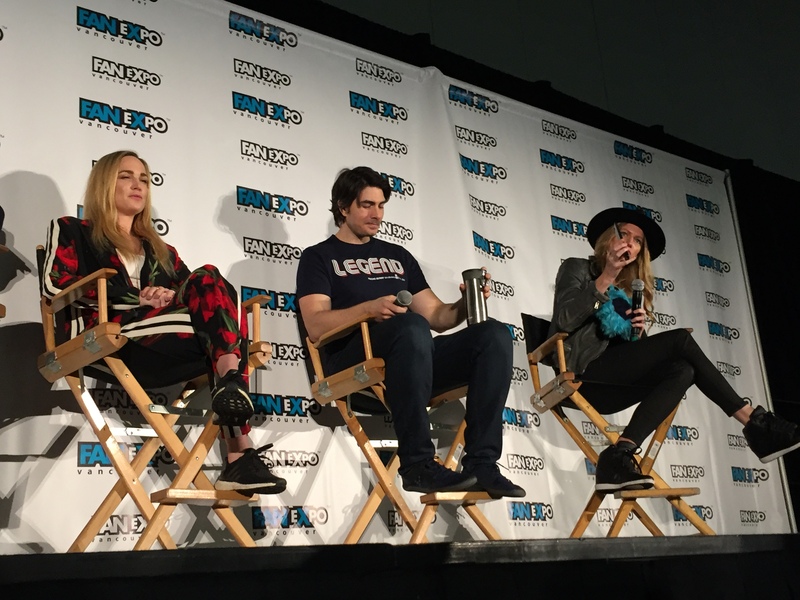 With just over a week before the 4th season premiere of DC’s Legends of Tomorrow, stars Caity Lotz (Sara “White Canary”) new series regular Jes Macallan (Agent Ava Sharp) and Brandon Routh (Ray Palmer/the Atom) dropped by Fan Expo Vancouver to meet fans to talk about the show and offer some glimpses into season 4. For one, Routh said that the show will explore the Ray and Nora relationship while Lotz hopes the show gets more crazy and Macallan said co-star Nick Zano noted the show is this close to becoming DC’s version of The Office with the characters breaking the fourth wall after making a joke. When asked if the show would ever consider a musical episode, Routh said yes and Lotz even teased an upcoming episode that includes some crazy songs and other fun stuff that fans can look forward to. Beebo was also named the most effects heavy character the show had to do so far and Routh mentioned the fight between him and Mallus was also challenging. Lotz also named the season 2 finale as a challenge for the actors as they had to act opposite themselves and it required a lot of work with their doubles and different camera angles. Macallan called the Ava clones scenes as the most CGI-heavy scene she has been involved with on the show. Macallan mentioned that scene took all day to shoot and her having to stand in every possible spot and getting spooked by stunt guys wearing an Ava mask. A fan really appreciates the the LGBQT representation on DC’s Legends of Tomorrow and wanted Lotz thought on the backlash of Ruby Rose’s casting as Batwoman. “I don’t understand the backlash against [Rose]. I met her in LA and she was awesome and super sweet and even asked me how I pee in my costume.” said Lotz. She added that she hopes Sara and Kate Kane interact and that Ava should watch out. Macallan joked that she would break Batwoman if she came between Avalance. This is a bit interesting considering that Legends is sitting this year’s cross-over out. Perhaps this was more wish-fulfillment or accidental spoiler. Routh, meanwhile, was in the middle of filming Arrow season 3 when he heard about plans to spin his character Ray off into his own show along with Sara Lance. “I was excited of the possibility of creating a show filled with superheroes,” he said. For Macallan, she was looking to do something different after 4 seasons on the soapy Mistresses. The DC’s Legends of Tomorrow character they would want to plan other than their own. Macallan said Sara and Routh said Mick but wouldn’t mind being Sara as a whole episode could be built with him just trying to get into the White Canary costume. Lotz said she would be Mick too because most of her lines would just be saying beer. DC’s Legends of Tomorrow premieres Monday, October 22, 2018 at 9pm ET/8pm CT.